When a tooth becomes infected, Dr. Fink may recommend root canal treatment to save your tooth and prevent the need for tooth extraction. Dr. Fink and his staff are committed to patient comfort and health; you can be confident that we will make every effort to ensure minimal discomfort and an efficient and effective treatment. Root canal treatment is a type of endodontic therapy that is often recommended if the tooth pulp and nerves become infected. This may occur if injury or decay reaches the nerve of the tooth. When left untreated, this type of infection and disease may cause the tooth to die and necessitate tooth extraction. To restore the tooth and avoid the need for extraction, we will remove the infected and injured tissues, clean, and fill the tooth. We will then cap the tooth with a restoration, such as a dental crown, to return the tooth to its original shape and structure. Root canal treatment has a reputation for being an unpleasant procedure. 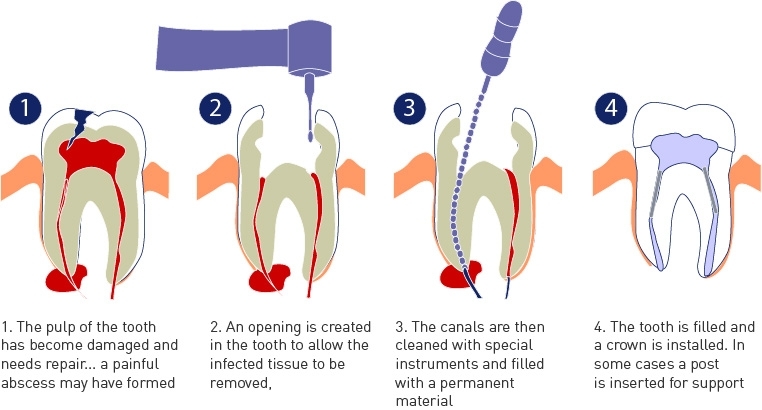 In reality, however, root canal treatment can often be completed with minimal discomfort thanks to advanced techniques, tools, and anesthesia. Dr. Fink, along with his entire dental team, works hard to provide you with a pleasant, comfortable experience each time you visit our office. To learn more about root canal treatment, contact us today at 602-942-4260 or schedule an appointment. We are committed to restoring your smile’s health.